James Brake is creator. I’m born and raised in Mississippi and spent a lot of time on my grandfather’s farm. Was a very technically oriented kid. Went off to travel in the world for a number of years, always stayed in computers, but always had multiple home gardening projects including hydroponics to grow vegetables and stuff when I lived in California and I’ve taken it to a new step here. Now you’re in Hawaii, right? Are you all in Hawaii? Yes, we are all in Hawaii. Greg, I’m originally from NJ, after college did a lot of work in technical sales, taking an engineering degree to kind of help folks develop businesses and technological solutions and deliver those solutions accordingly, as well. Krysta Carmack, was unable to connect without static so she types a few answers here and there. The Growbot, is about the size of a coffee table, and what it does is it grows a salad pretty much everyday in that coffee table are size. It uses hydroponics, kind of automation for adding the plant food and adding the water, so you don’t have to think about it. You just put it in your backyard, connect the hose, you put in your seeds, and then about ten days later most of your seeds should have sprouted, so you take off the germination cups, and about 4 weeks later most lettuce is ready to start harvesting. Most of the varieties of lettuce that we recommend that you grow is the kind that perpetually grows new leaves. You can also grow kale, carrots, and other types of root vegetables, there’s an area of that as well. That’s kind of the basics of it. The core thing is it’s very very easy to use is what I was striving for and also it’s very economical. For getting that salad a day, plus some kale and some other vegetables on less then a dollar a day in plant food, which is just a mixture of bird manure which is guano, seaweed, folic acid, which are all naturally sourced. Folic acid is in soil and sea water, it’s a naturally occurring substance, source for this is a mineral called leonardite. It’s gonna be on Indiegogo. I’ve been building prototypes, testing out the technology for about 7 years. I started in California with a really big one, that my wife wasn’t happy with how big it was, it wasn’t portable. So the next one that I built, had a much smaller footprint, and was portable so if we wanted to have a barbecue or the kids want to use the backyard for kickball etc., we could easily move it out of the way and then move it back to the center of yard, where the best light was. Then we moved to Hawaii, and we built this Growbot. So this Growbot has the small footprint and we can just pick it up with 2 people and move it back to where you want it. It’s got 7 years of work on it, multiple versions of it, looking for what worked best. This particular model, we started on it, and finished this design late last year, actually had it completed early January, and the first plants growing in early February. We have it all documented. We haven’t had to buy lettuce since early March, kale came in a few weeks, later and that’s been doing fantastic. And we’ve had tomatoes, and cucumbers and things like that. 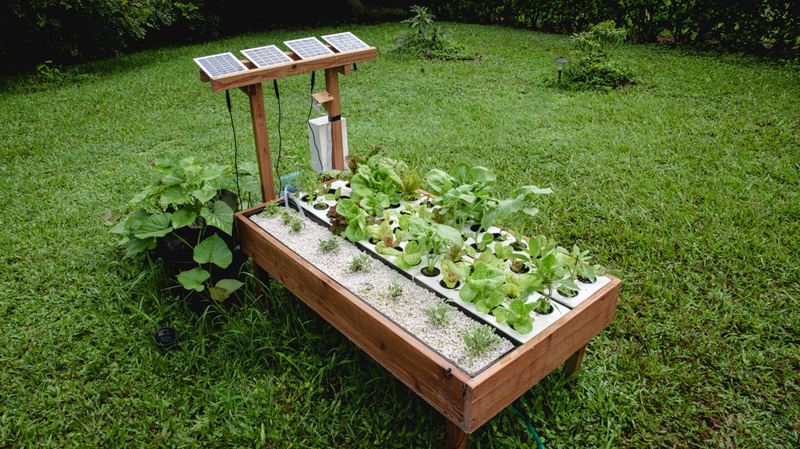 I love this idea because it’s going to enable people who want to grow lettuce and vegetables in the winter, could you have it in the winter, is there enough light? I guess you could have grow lights? Absolutely. You can totally use grow lights, they are becoming much more economical to purchase and to operate, they’re called compact fluorescents, or LEDs. Both of those are pretty economical. We’re going to come up with a package to set up in a garage or another spare room that’s convenient you just have to have a water fitting so you can connect the water. We want to keep the automation cause that’s where people get into trouble, they forget to water it. Yeah, that’s one of the problems I’ve personally had, with the models of the Growbots, that were not fully automated, was when I forgot to keep it watered. For consistent growth you just have to keep adding the plant food on a consistent basis. Is it a table full of water? or are they growing in dirt? It’s a mixture of water and perlite. So you just get the seeds, put the seeds in it and it does it’s own thing? Well the seeds are the miracle. Put the seeds in coconut core pellets inside these little net pots that barely touch the water, the water wicks up, the seed gets wet, it starts to grow, 5-10 days later you have a little plant and depending on the plant, you can start harvesting. most of the miracle, is inside the seeds, we just give it a place to live. Krysta typed in you can use any medium you want, it doesn’t have to be the perlite. It doesn’t have to be perlite, we haven’t tested it with the coconut core, but the core technology with the water and feeding it lends itself to have a lot of different things. Some plants do better in pure coconut core, and some do better in something that’s more moist like peat, so it depends on the plants that you are growing, you might have to test it. Greg: For the crowd-funding campaign which we are launching on Indiegogo, folks will be able to pre-order a Growbot, we have the prototypes ready to go, the agreements with manufacturers, we’ve got everything in place, and the crowdfunding campaign will give people the opportunity to see the Growbot, get their questions answered, to understand more about it, and effectively pre-order their Growbot. We’re targeting a delivery of spring 2016 for grow Growbot. People will be able to pre-order theirs and encourage to share with all of their friends. We will reward referrals and people will effectively be able to earn their own Growbot. Kind of like network marketing. The Growbot is intelligent, it’s a full computer inside the coffee table, what that computer has is a series of maps, that allow it to recognize plants, once it identifies a plant it will then be able to give it the proper amount of nutrient. Then what’s cool is, it’s also a community effort, so as more and more people get to using the Growbot. Every time the Growbot doesn’t recognize a picture, it can upload it to our servers and we can look at that picture and say woah, what is that? Then as we have 1000s of that picture we can train the computer to recognize it. Then once we have enough pictures of that plant, then we can upgrade all computers at once, and all the Growbots will be upgraded will all know how to grow like Bok Choy for example. Like Gogi berries, because somebody said I’m growing Gogi berries, and I bought a Gogi berry plant at the farmer’s market and I have no idea what to do with it, and I haven’t had time to research it on the internet, so I stuck it under an apple tree, and it gets a little shade from the apple tree and when the apple tree get’s watered it gets some water. Greg: That’s exactly what we want people to do, be able to experiment, and learn without having all that gardening knowledge. There’s too many people out there that would love to have organic produce within steps within their kitchen, but they don’t have the time, or the ability or the knowledge to do so. So we really want to be able to provide that organic fresh food, for people who might not be able to afford it or who have mobility problems, and that’s really what we’re accomplishing with this. So I’m wondering will I be able to grow avocados, or lemons or things I couldn’t normally grow? Those bigger plants, won’t really fit the big plants. Avocados might be a little big, I won’t stop people from trying I love avocados, do have an attachment, like I’ve been growing sweet potatoes, they grow really well inside there. It’s a good system to grow extra potatoes, strawberries, a full range of plants. I’ve tried to grow melons but here on the island we have fruit flies. I continue to try I just want to have more melons. Christy Wilhelmi on Garden Nerd podcast posted this great homemade fruit fly trap that’s easy to make. Also there’s an app that goes with the Growbots. So if you’re like a lot of people, quite busy, and you’re at work, you can actually get a picture of your Growbot, so you can check to see what’s going on with your Growbot. There’s also the ability, it’s just a software change, these friends of ours have a little farm outside of Austin TX, and they live primarily here, they want to have a Growbot staged and ready to grow so they can turn it on remotely so about 6-8 weeks before they arrive, there’s fresh vegetables when they get there. Some of the fresh herbs, we always have cilantro and basil in the bots. It’s kind of a permaculture things, where these aromatic herbs will keep away some of the pests, and they taste good. I’ve never been successful growing cilantro which I love. I don’t even have a cilantro plant in my garden, and I don’t put basil out because it seems so fragile and just freezes so easily I just keep it in my window all year long. Jackie this is Greg again what really want to do is create communities of backyard gardeners where people are able share those tips. If someone is your community is able to grow cilantro well they’re showing you how they do that, or what plant food they add to the Growbot that does that successfully. I was thinking when you were talking about avocado trees, is maybe someone starts a seed in a grow bucket to a certain point. and they transplant it successfully, not only will the Growbot, learns using it’s artificial intelligence its understanding how that plant grows best but the people eating from the Growbot are able to share those ideas, how they are successful with this plant or this herb. We want people to do local plant trades or people doing local seed trades. We’re really excited about the prospect of how that community can be. Are you guys millennials? 1980’s-1997. I am (Greg) and Krysta is. I think the millennials are rocking this world. I’ve been thinking about writing about the cool millennials who are doing fun stuff like this. There’s a great book, Cause for Change, and it’s all about engaging millennials in different ventures. I forget the name of the author, but she’s brilliant, did a bunch of that research. When James first came to me with the idea, I got so excited about what we’re trying to do. I don’t know why but I listen to a lot of podcasts and I’m addicted to business podcasts and they interview a lot of millennia’s and it seems they’re really doing great things social causes, the environment, health care, education and sharing with people in developing countries and our country too, they seem like a pretty cool generation. James: I can go back to picking pecans in my grandfather’s pecan orchard in Mississippi. My first memory is being little kid, having to weigh them in your hand and culling them, picking which ones are good and which ones are bad and putting them in the metal bucket. Greg: For me it was working with my Italian-born grandmother to grow tomatoes and peppers in her backyard, she had a very small backyard but she made it work to have her fresh herbs for her delicious home cooking. The power of homegrown and what it can do. I’ll be bluntly honest, I haven’t touched it when I moved out here to Hawaii, with the intention take a break from the tech world, I wanted to just unplug, and I started doing work/trade on an organic farm here in Hawaii. So I’ve been doing that for about a year now. Is that part of the WWOOFer program? Not exactly, the WWOOFer program is Worldwide Opportunities on Organic Farms this farm is not on this part, but this farm is not, but it’s effectively the same program. What island are you on? Are you all on the same Island? Yes, we’re all on Kauai. And Krysta says: I recently tried for the first time and failed miserably. What was supposed to be this amazing backyard fruit and vegetable garden of Eden has turned into weeds and bush. So I’m officially giving up and getting myself a GrowBot because I can’t even keep an orchid alive…. James: Organic gardening for me is using the air, good air, good water, the best nutrients that you can find that are naturally sourced. Really just loving on the land. Loving on the environment around you. One of the great things about the rowboat is there’s no run off. All the water is used, so it uses very little water compared to traditional gardening. Also, there’s not the run off that you traditionally get when you put fertilizer in the ground some goes tot he roots, and some goest to the drain, which eventually goes to the ocean. How’d you learn about hydroponics? I was just looking for a small garden solution. When I lived in Oakland, California, our backyard was tiny. We just physically didn’t have enough space for a traditional garden, so I had to look outside the normal stuff. James: I would say we just need to be very conscientious of every decision we make. If we’re all very conscious of what we’re doing, what we’re buying, what we’re investing in, we can then solve the problems that are local to us. And I think that if people can get really local, and be very present in their local problems and if we fixed the local problems, all the big problems just get fixed because we just fixed everything locally. I think people just get distracted with what’s on the news thinking our biggest problem is way far away, thinking it’s the biggst problem, when it’s them not paying attention what’s going on right in their neighborhood, right in their homes sometimes. If you get a Growbot, it’s really easy. It’s a really easy thing to use. I developed it primarily because I’m not really a very good gardener, I get busy with projects that I’m working on, I don’t always remember. So with the Growbot you get really nice salad. I have multiple ones, and it’s just fantastic not having to go to the store to buy my produce. Wow, so like 10 of them together is like a regular full-sized garden? x5, because you can grow about 5 times the amount of food in the same amount of space in a Growbot. The hydroponics and aquaponics people say that too. A lot of it is the technology or the method, because the roots that are in water, and because the water is being moved past the roots that has all the nutrients, it’s not like in dirt where the nutrients are in that area and the roots have to keep spreading out toe get the nutrients. That’s as good as it’s gonna get. With the water carrying the nutrients to the roots it’s a lot more productive. What about people who are afraid of technology, there’s still lots of people who are afraid of technology, still don’t have a Facebook page, don’t feel comfortable with a smart phone etc? I totally was conscientious of it, so my mom who doesn’t feel comfortable operating a cell phone and then my youngest daughter who’s now 10, those are my primary test subjects, so when they’re using the Growbot successfully, including the set up, that was my use case. When they pre-purchase on Indiegogo, then they take it out of the box, plug in the water hose, put in the seeds, and it starts growing, there’s no other buttons to push. Then its just that natural thin of going to look at it on a regular basis,wanting to nurture our plants. I’m one of those people who really likes to gaze at the garden. Really helping people, you don’t have to do the weeding, digging, right nutrients you don’t have to do all those things you have to do to raise a good garden, so it’s actually easier then a traditional garden in a lot of ways. The Indiegogo campaign starts August 8, 2015. You can go to mygrowbot.com will redirect you to our email list signup if you’re an early adopter within 24 hours, we’re gonna give you a 25% discount. We’ll be emailing you with some updates. We’d love people to give us feedback on it, because as much as we’ve put a lot of love and attention into it, I’m sure there’s room to make it better. Krysta says, they’re very affordable, less then the cost of a new smart phone! We’ve kept the cost down, because if people can’t afford to use it, it’s not a very good device. So we’ve kept it down to less then the cost of smart phone. My desire is to help people, like me, that want to have fresh organic produce, super convenient, more convenient then going to the store, so that money in our pocket can stay in our pocket, if we want to go on a trip. Spending $40 3 times a week, it’s the right thing to do. What you put into your body is super important, it keeps you healthy and your not going to the doctor. Being able to grow your own organic produce will be great for people, to save money, and I’m excited to grow sweet potatoes! Depending on your season, but every 3 months, you should be able to get 10-20lbs of potatoes in each Growbot. You could grow other things. Thank you so much. I’m glad you are enjoying it! If there is anything we can do to help with your garden journey let us know! .. Amazing .. I will bookmark your web site and take the feeds additionally?